Continuing our series of long walks to prepare for a possible through hike of the Kal-Haven trail, Jackie and I walked 16.72 miles today. 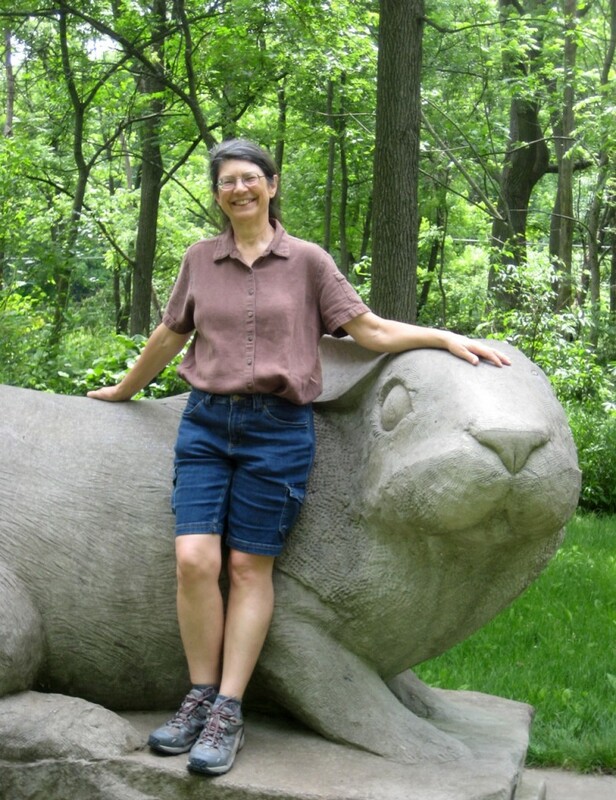 We walked to the University of Illinois’s arboretum, and then on through south Urbana to Milo’s where we had lunch. Then we walked to Meadowbrook Park and along the trail that goes along the south and west edges of the park, then through married student housing to the old Motorola building (where OLLI is now) to refill our water bottles, and then on home. Jackie has asked that I specifically mention that we got a very close look at three juvenile Stufflesbeam (the plural of Stufflebeam, which is what we call ground hogs), just on the west side of the railroad embankment where Stadium Drive crosses Neil. One in particular stood just a few feet away, eating grass with great enthusiasm, close enough to give us a great view of his little nose. The picture Jackie took of me is pretty good—that’s what I look like. 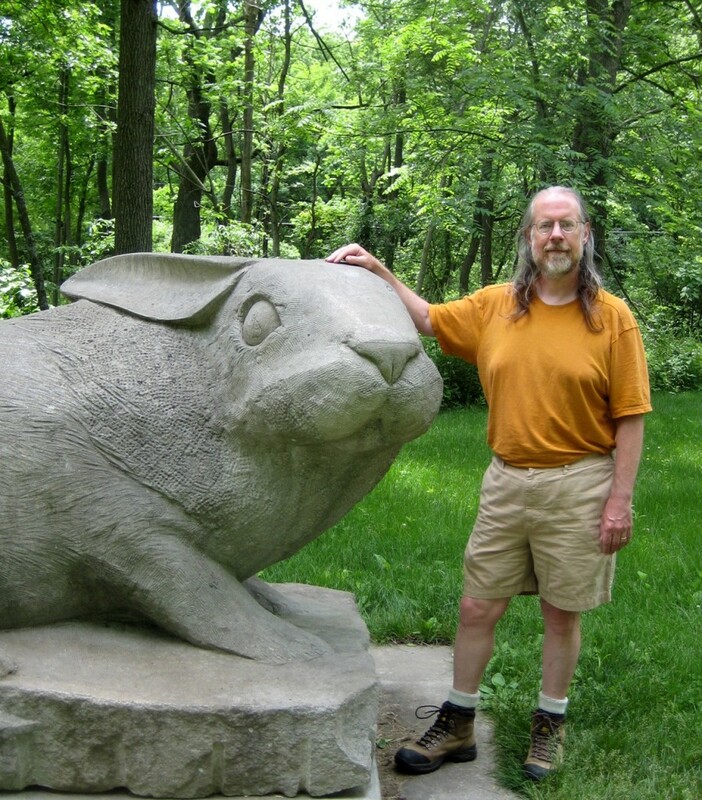 It’s of some interest to me because we took pictures with this sculpture a few years ago, and I didn’t like the pictures of me because of my weight at the time, and there was no way to crop the picture to hide my stomach and yet keep the rabbit sculpture. And, although Jackie just got an ordinary good picture of me, I managed to get a great picture of Jackie. It’s a perfect picture of the Jackie I know—the Jackie I’ve been married to for 21 years. By merest happenstance, Jackie and I both had the same distance as the furthest we’d ever walked: 14 miles. She’d hiked hers at Yosemite. I’d hiked mine in the Uinta Mountains in Utah. On today’s hike, we topped that. It’s not such a great accomplishment. Jackie had done her previous 14 mile hike carrying a full pack. My previous long effort was made with just a day pack, but was at least done in the mountains. Today’s walk was done on sidewalks, with almost no gear at all—water, sunblock, and my tablet for its GPS tracking. On the other hand, the distance this time (14.12 miles) is a lot more reliable than the distance of my previous long hike, which was probably eyeballed off a trail map—no GPS that time. We walked to campus, then through the neighborhoods of southern Urbana to Meadowbrook Park, after which we headed north along Race Street and then back west along Florida. We stopped for lunch at the Yellowfin Restaurant, walked briefly through Hessel Park, along the short linear Harris Park, and then home. It took almost exactly the same time as our last week’s shorter (12.1 mile) walk, most of the speedup due to not taking coffee breaks, but also walking a bit more briskly. I’m feeling pretty good. After last week’s hike, my Achilles tendons felt (for a couple of hours) like I might have really injured them. This evening, although I’m pretty tired, I feel fine. Every year I look forward to the point when I’m in good enough shape to go for open-ended runs—that is, the point when I can just run off in whatever direction I like, confident that intuition will let me know when I need to turn around, and confident that I’ll be able to run on back home after I do. Just before I declare myself ready to take on open-ended runs, I like to do a more carefully planned long run that I think of as my “safety” long run, as a test that I’m really up for running the distance. I’ve got a route that I’ve used for this purpose before that goes out and back along McNalley’s Alley, then in a figure-eight around Centennial Park. Despite covering a bit over 4 miles, this route never has me much more than a mile from home, so if it turns out I’ve misjudged some aspect of my fitness and have to bail on the long run before it’s over, it’s not a big deal to just walk home. So I did my “safety” long run today, and hereby declare myself fit for open-ended runs. It’ll be nice to get out and run wherever my fancy takes me. It happened this way: I suggested to Jackie that we might hike the full length of the Kal-Haven trail. She’s a long-distance walker from way back, so she said yes. The Kal-Haven Trail is a rail trail. It runs from Kalamazoo to South Haven. It’s been around for a while. Steven and I bicycled it back when he was a grad student. The trail has since been expanded into downtown Kalamazoo, but the part I’m thinking of has its eastern terminus just west of US 131 and runs 33.5 miles west to South Haven. I thought about taking two days to hike the full length of the trail, but that seemed inconvenient. We do a mile in about 20 minutes, so the full length ought to a bit over 11 hours of walking (plus a couple of hours for lunch and breaks). We could probably find a bed and breakfast somewhere around the midpoint, but then what? Hike 6 hours the first day, check into the B&B, and then hang out for the rest of the day? Even if we had a very restful evening, we’d still be a bit tired and sore the next day, when we’d have to hike another 6 hours. Much better to just hike through in one go. With that thought in mind, we’ve been doing some long walks to get into shape. We do walks of 3, 4, 5 miles pretty routinely, so I came up with a plan that leaves those ordinary walks alone, but now includes a long walk each week. We started with a 3 hour walk a couple of weeks ago. The plan calls for adding 30 minutes each week. Today’s hike was supposed to be 4 hours and cover around 12 miles. The total distance was 12.1 miles, right on target. It took us just over 6 hours, including a leisurely lunch plus two coffee breaks, so total time walking was probably right about 4 hours, exactly as planned. Our first miles were done at just under a 20-minute pace while our last miles were done at just over a 20-minute pace, so I figure I’ve got the timing about right. My plan has us adding 30 minutes to our long walk each week for another 8 weeks, after which our long walk will be 8 hours (and cover about 24 miles). I figure once we do that with some degree of ease, we’ll be in adequate shape to push on and cover the whole 33.5 miles. It’s a low-key sort of plan, though. I only want to hike the trail if it’s going to be fun. If the 6 or 7 hour walks start seeming burdensome rather than fun, or if one of us gets injured, we’ll abandon the plan. This hike, though, was great fun. A companionable way to spend the day with my wife. And it’s good to know that we’re up for walking over 12 miles if we need to (or even if we just want to). I was generally pleased with the Merrill Road Glove shoes that I bought last summer, but they didn’t offer quite enough protection for running on gravel. Because of that, I largely quit running on the gravel road around Kaufman Lake, which had been my standard short run. To expand my trail-running options for this year, I bought a pair of Trail Glove shoes. Today was my first chance to give them a try, and of course I did my old 1.5 mile Kaufman Lake loop. It was a good run. I felt comfortable all the way through—no ankle or knee pain. I finished with some energy left, enough that I’m sure I’ll have no trouble running the 2.2 mile Centennial Park loop that served as my standard short run for the second half of last summer. I managed a 11:26 pace, solidly in the mainstream of last year’s runs. I’m not quite where I hoped I’d be, because I just couldn’t bring myself to put in the miles on the treadmill. I did okay in the first half of the winter, but in the second half, I barely ran at all. Because of that, I’ll have to be somewhat cautious ramping up the distance. I have no doubts about 2.2 miles, but I’ll run that a couple of times before attempting longer distances. I ran almost 6 miles as recently as December, so expect I can recover the capability of running that distance again pretty quickly, but I don’t want to injure myself. Hence: caution. The Trail Glove shoes worked fine—provided adequate protection against hard/sharp rocks while keeping most of the “barefoot” feel of the Road Glove shoes. One risk: The forecast is for 6 straight days of nice running weather. I’ll need to take a couple of those days as rest days, which may be hard to do. We had a few days of mild weather this past week, giving me a chance to get some outdoor exercise. I took advantage by running almost 6 miles on Monday. That’s my longest run in years. Back in 2004, I ran 8 miles as my last long run before running the 7.1-mile Lake Mingo trail race. But since 2008, which is as far back as my current exercise log goes, this run (5.83 miles in 1:11:35) is my longest. It was probably a bit further than I should have run. It left my knees kind of sore the next day. I’d gone 4.6 miles on Saturday—a much more reasonable distance for my current abilities, and probably part of the reason Monday’s 5.83 was too much. But knowing that I might well not get another chance to run outdoors for months, I couldn’t resist the urge to overdo it. Efficiency—I wanted to get enough exercise to develop and maintain a basic level of fitness with the least amount of time, effort, and money devoted to the effort. Capability—I wanted to develop and maintain the ability to be able to run if it was necessary. Both those goals are easily satisfied with a weekly mileage of 10 to 12 miles—a long run of 5 or 6 miles together with two or three runs in the 2 to 3 mile range—which is where I’m at right now. There’s certainly no reason to run further for health. If I wanted to devote extra time and effort to improving my health there are a hundred better things to do (starting with eating better, but including things like improving flexibility and core strength). Running more is probably a negative for health—my chance of injury just goes up from here. The only thing running further would improve is my ability to run further. Even knowing all that, I find that I always want to run a little further. Once I’ve run five miles, I want to run six. Once I’ve run six, I want to run seven. I hesitate to follow that progression to its logical conclusion. And yet . . . . I have been on-and-off reading about “paleo” diet and exercise programs (also called “primal”). I think there’s a lot to paleo, on an evolutionary basis. On the other hand, there are an awful lot of post-paleo lifestyles that have proven to be entirely successful, in the sense that generations of people have eaten all manner of particular diets and been healthy. (Native Americans ate corn, beans, and squash. Scots ate oats and kale. Lots of people ate rice and lentils.) Given that, and the fact that paleo diet programs doesn’t match well with what I like to eat, I’ve only paid a bit of attention to them. Basically, I’ve let them reinforce my preconceived notions. I have a similarly divided appreciation of paleo exercise programs, but there I think I’ve worked out what was bugging me. The half I agreed with is that very short bursts of very intense activity should be a key part of an exercise program. I’ve only made limited moves to incorporate this insight into my own workouts, but only because those sorts of intense bursts are hard. I suspect it would be a really good change to compress my current 20-minute lifting workout into 10 minutes, which I could do if I really hustled between machines and counted the first set of the three leg exercises that I do as a warm-up. The half I disagreed with is the half that seems to dismiss endurance exercise. Now, it may be that my reading of paleo exercise programs has simply been so cursory that I missed the paleo version of endurance exercise. But it sure seems to me like a large fraction of the paleo folks don’t merely dismiss endurance exercise, they actively disdain it. That puzzled me, because it seems to me that the paleo human was the quintessential endurance machine. As I say, I think I’ve come to understand the objection, which is that you can’t do high-intensity endurance exercise unless you eat loads of carbs. The paleo folks think you should do endurance exercise, as long as you keep the intensity level at a level where you can perform on a low-carb diet. Further, they seem to think that the appropriate level supports walking or hiking, but doesn’t support endurance running. That’s crazy, although it’s understandable. The modern way of training to run is all about prompting the body to mobilize glycogen stores, by depleting those stores and then eating a high-carb diet to replenish and boost them. That is not the only way to run. You can also engage in endurance activity powered mainly by fat stores. When I was in high school, I decided to bicycle to Saugatuck, see a play, camp out overnight, and ride home the next day. I didn’t have a cyclometer in those days, and have always claimed that the distance was 75 miles each way. Google Maps tells me that my route (or very close to it) is 69.3 miles. Close enough. I knew nothing about carb or fat metabolism. I made no plans to get food along the way, and in fact ate very little. I was exhausted. My speed dropped from 14–17 mph down to 7–8 mph. And it stayed there. That’s the important part of this anecdote. It stayed there. I rode another 30 miles or so that way. I rode it at less than 8 mph, but I rode it. I got up the next morning, still exhausted, got back on my bike, and rode a few miles to a breakfast spot and ate my only proper meal of the whole trip. It didn’t help much. I rode the whole way home at 7–8 mph. If you haven’t trained your body to use fat stores for endurance activity, you’ll be pretty slow—as I was on my ride. And you’ll never be fast the way someone who has trained to build up glycogen stores can be. But with a modest amount of training, you can be plenty fast enough to run. There are times when it is convenient to be able to run for an extended period. If you want to have that capability, you need to run—and not just occasional short sprints during your walks. We don’t have much direct evidence of what paleolithic humans actually did, but I have no doubt that, in addition to walking a lot, they ran a lot. The human body is just too well adapted for long-distance running for it not to have been a key capability over an evolutionarily long period. Yesterday, I went on my first open-ended run of the season. On earlier runs, I pretty much knew how far I was going to go and what route I’d follow. Occasionally there’d be a bit of room for variation—I might think, “If I’m feeling good, maybe I’ll add a second lap around Kaufman Lake,” or “Maybe I’ll add the leg out to Bradley and back.” But by and large, I knew to within a few tenths of a mile how far I’d run before I took my first step. The reason was that every run would take me a large fraction of as far as I could run. There was no chance I’d just decide on a whim to go a few miles further, because I couldn’t run a few miles further. So, it was a great treat yesterday, to head out for a run with only a general idea of where I’d be running, and with no specific plan how far I’d go. I knew I’d run halfway down O’Malley’s Alley (the short bit of rail trail that I call McNalley’s Alley), and then cut over into the neighborhood south of there. But I’d had only a vague, somewhat aspirational notion that I’d continue on as far as the trail through Robeson Park. But I knew that the trail would cross several different roads, and that I’d be able to head for home on any one of them, if I decided that I’d run as far as made sense. In the end, I headed home when I got to Crescent. On some future run, I’ll push on as far as Mattis, and maybe continue on down the Simon trail before heading home. At over 50 minutes, it was definitely a long-enough endurance effort to produce significant levels of endocannabinoids, which I presume is the reason that my memory of the run is mainly just a strong sense that I was having fun and feeling good. There are only a few spots where specific details are sharp and clear—the spot where I had to back up and run on the grass next to the trail, to avoid a muddy patch, the spot where I thought, “There’s a hill here? How did I not know there was a hill here?” and the spot where I slowed to a walk so I could look back over my shoulder and read a street sign, so I’d be able to make a map. Last month I posted a bit on endocannabinoid production in cursorial mammals, pointing to an article on new research that both supports the hypothesis that endocannabinoids are responsible for runners high, and that the whole system may have evolved to encourage and facilitate long-distance running in mammals whose success depends on it. I found that I was still quite interested in endocannabinoids and running, and a little more research brought me to this 2004 survey paper by A Dietrich and W F McDaniel in the British Journal of Sports Medicine, endocannabinoids and exercise. It turns out endocannabinoids are involved in a whole range of systems, both centrally in the brain and peripherally in the rest of the body. Some of the things that endocannabinoids do are entirely to be expected by anyone who has any experience with exogenous cannabinoids: pain relief, sedation, reduced anxiety, euphoria, and a general sense of wellbeing. Anandamide, a particular endocannabinoid, prevents edema and inflammation—probably a very useful mechanism. After all, running is bound to produce minor tissue damage to the feet and legs. Those endocannabinoids probably greatly reduce the need to get clever with ice and elevation and compression and anti-inflammatory drugs. Anadamide also acts as a vasodilator and produces hypotension, perhaps facilitating blood flow during exercise. Although in large doses cannabinoids produce motor inhibition, in low doses they produce increased locomotion. It appears that they make it easier to perform motor skills that have been practiced to the point where performance is automatic, such as running. Cannabinoids act as brochodilators, perhaps facilitating breathing during exercise. On that last point, I’ve certainly noticed that going for a run produces a profound relaxation of my upper airways. My nasal passages are pretty much permanently inflamed due to allergies—to the point that I spent most of last year needing to use a nasal steroid spray if I wanted to be able to breath through my nose. I have no idea if it’s mediated by endocannabinoids, but my nose is much, much more open after a run than it is before a run, and the effect lasts for hours. One thing I found particularly interesting was an explanation for why cannabinoids don’t seem to be very addictive. They’re involved in the same dopamine systems that other addictive drugs are, and by rights ought to produce withdrawal symptoms when they’re withdrawn. In fact, you can produce those symptoms (in rats), by habituating the rats to THC and then administering an antagonist that blocks cannabinoid receptors. But mere withdrawal of the drug won’t do it, apparently because the drug hangs around in the system for so long that even abrupt withdrawal ends up resulting in a gradual tapering off. We do not suggest that the addictive aspects of exercise are identical with the addictive properties of exogenous cannabinoids, but that a similarity exists between the desire that some people have for exercise and the desire they may have for exogenous administrations of cannabinoids. The parallels between these results and the subjective experiences associated with exercise abstinence, as discussed previously, are considerable. Using trained male college students running on a treadmill or cycling on a stationary bike for 50 minutes at 70–80% of maximum heart rate, we found that exercise of moderate intensity dramatically increased concentrations of anandamide in blood plasma. That sounds pretty reasonable, although I wish they had data for exercise for 10 to 40 minutes as well. My guess, based on reports of runners high, is that it does take upwards of 50 minutes to start seeing a significant increase, but it’s just a guess. It’d be nice to have some data. Most unconditioned people can’t maintain 70–80% of maximum heart rate for 50 minutes, meaning that if it’s true that it takes 50 minutes, most people won’t be able to experience this “dramatic” increase. The typical sedentary person would probably have to train for weeks to achieve this level of performance. So far this year, my longest run was 26 minutes. But it was a great run (unlike my first long runs of the previous two years, which were not entirely successful). I’m quite optimistic that I’ll be able to ramp up the distance without much difficulty. 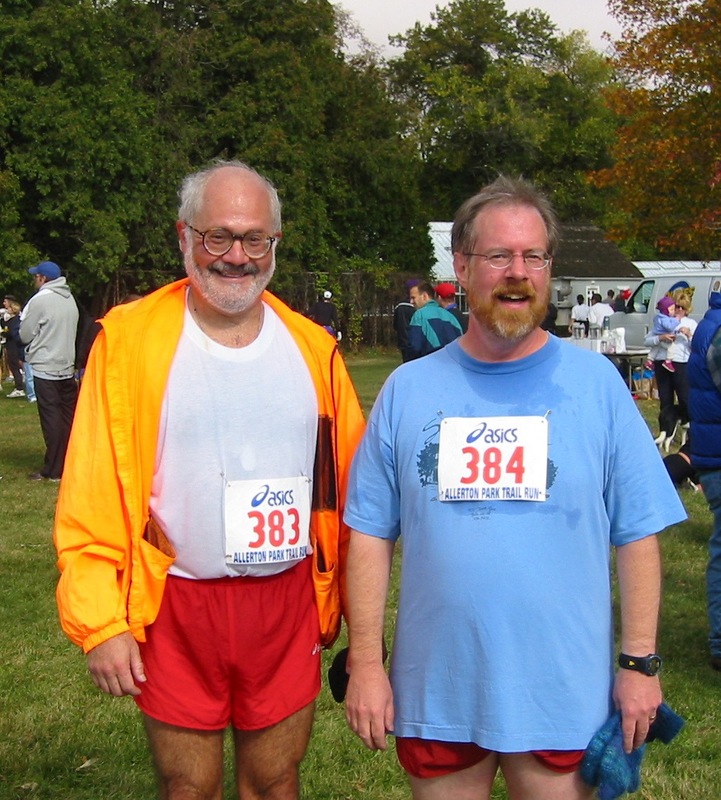 Chuck McCaffery and me, after finishing the 5.5 mile Allerton Park Trail Race in 2003. Photo by Jackie Brewer. I remember back in the late 1970s and early 1980s people were speculating that endorphins might be the source of runners high—and I remember how disappointed they were when experiments showed that exercise-induced levels of endorphins were much too low to produce the reported levels of euphoria.
. . . a neurobiological reward for endurance exercise may explain why humans and other cursorial mammals habitually engage in aerobic exercise despite the higher associated energy costs and injury risks, and why non-cursorial mammals avoid such locomotor behaviors.
. . . couch potatoes are not about to leap suddenly out of their comfy chairs and experience the pleasurable effects of exercise, because they probably cannot produce enough endocannabinoids. . . . Inactive people may not be fit enough to hit the exercise intensity that leads to this sort of rewarding sensation. This is why I’m so pleased at having come up with an exercise regimen that I can persist with over the winter—I enter spring already able to enjoy the euphoric joys of exercise without having to first get in shape.